Ford Philippines today announced a record June performance with retail sales increasing 17 percent year-over-year to 3,273 vehicles led by continued strong demand for the Everest, EcoSport, and Ranger. The record month helped Ford cap its all-time best quarterly performance, delivering retail sales from the April-June period of 8,922 vehicles. “The wide popularity and strong appeal of the Everest, EcoSport and Ranger are continuing to drive our sales momentum this year,” said Lance Mosley, managing director, Ford Philippines. The Everest SUV remained Ford’s best-selling vehicle in the country with June sales rising 8 percent from a year ago to 1,139 vehicles, helping drive its total year-to-date sales to 5,768 vehicles. The EcoSport compact SUV posted retail sales that jumped 15 percent from a year ago to 984 vehicles. Year-to-date sales of the EcoSport have increased 20 percent year-over-year to 5,225 vehicles, helping it remain one of the best-selling vehicles in the segment it helped to define. June sales of the versatile Ranger pickup truck rose 40 percent year-over-year to 880 vehicles, driving its year-to-date sales up 16 percent to 4,596 vehicles. 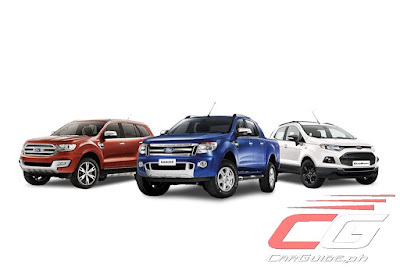 Available in a range of 15 variants in the Philippines, the ‘Built Ford Tough’ Ranger is the second-best selling pickup truck in the country. Ford’s North American-built models also contributed to the record June and quarterly performances. June sales of the premium Explorer SUV rose 57 percent 137 vehicles, helping its second quarter sales increase 47 percent to 353 vehicles. The Mustang sports car delivered June sales of 69 vehicles, boosting its quarterly sales to 124 vehicles. Is there a metric for after sales service? Just ask Toyota owners they will definitely tell you the truth about their experiences with ford after sales services. Even if there are any metrics on after-sales service, Ford will just ignore it. This is based on experience as Ford has been in PH for about 2 decades now, but still no improvement on this aspect of their business... one might say it even got worse due to the number of vehicles sold vis-a-vis number of service centers and technicians... I guess they want this bad PR to be their corporate identity! Fear of excise tax is real. ^Good luck new owners... hope you have a stress-free ownership experience! --- this is a non-paid greeting from your competent Ford service crew. Is the Honda Civic Type R Sold Out?